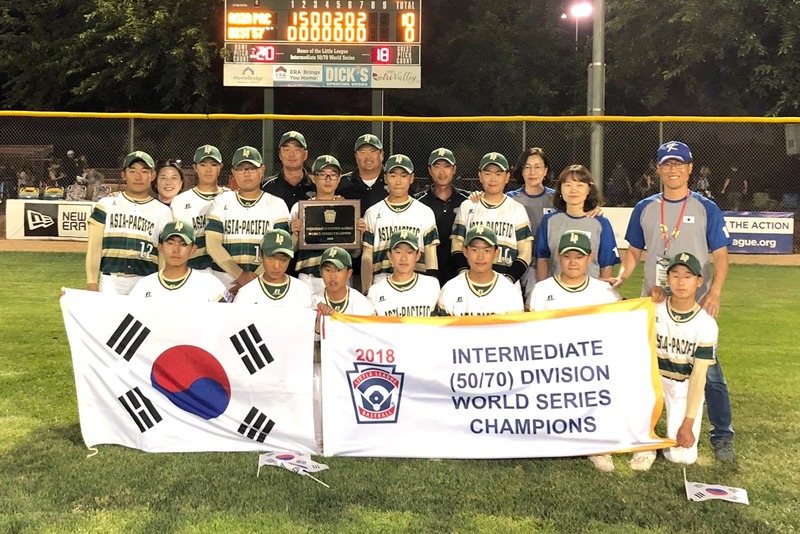 West Seoul Little League (Asia-Pacific Region), from Seoul, South Korea captured the 2018 Intermediate 50/70 Baseball World Series Championship by defeating Livermore/Granada Little League (Host Region), from Livermore, California, 10-0. The Asia-Pacific Region scored on a walk by Woo Hyun La in the first inning, a single by Da Heon Lee in the second inning, a double by Tae Wan Park in the second inning, a passed ball during Seung Joo Kim's at bat in the second inning, a single by Jun Sung Hwang in the second inning, and a double by Woo Hyun in the second inning. Seong Hyeon Lee got the win for the Asia-Pacific Region. He surrendered zero runs on one hit over five and two-thirds innings, striking out ten and walking zero. Seung Jun Lee threw one and one-third innings in relief out of the bullpen. A single by Tanner Griffith in the fourth inning was the only hit recorded by the Host Region. Jason Krakoski took the loss for the Host Region. He surrendered six runs on five hits over one and two-thirds innings, striking out two and walking one. Asia-Pacific Region scattered 11 hits in the game. Woo Hyun, Da Heon, and Tae Wan all had multiple hits. Asia-Pacific Region stole ten bases during the game as two players stole more than one. Seung Joo led the way with three.